I am a creative GENIUS marketing-wise. I can come up with a MILLION big ideas (okay maybe only hundreds of ideas), and now I have a system of capturing them so they don’t get lost… Getting Things Done – Start An Ideas List Today. But what’s next? How do I take all of those wicked good ideas and actually accomplish something with them? Working with one of my coaching clients I started really thinking through how rebel entrepreneurs go from having a ton of ideas to picking one or two that we are going to actually start fleshing out. What we came up with was something a little clunky so I kept noodling on it until I really had a clear vision of how ideas develop! It all starts with a huge list of ever idea you ever have. The really neat thing about allowing yourself to write down all of your ideas (dumb and dumber ones even) is that they get out of your head and onto the paper. This is just one huge list for each type of ideas you have. So I have an ideas list for Tshirt Sayings, one for courses I will develop and one for all the forms that I will make. So now you have a list of things that you could do, in random order, and did you spend any time thinking if they match what your business goals are? Have you figured out if they are a good fit for your current audience or will you have to grow a new one? How will you know if you are gaining any traction and getting things done? And don’t forget, tomorrow will come and you will have more ideas…sigh. Sometimes one of your ideas will get stuck in your head and not let you sleep. You start to think that it might get bigger than just a random thought so you need to start figuring it out more. You need to make sure you know exactly who you will be marketing to, how much you will charge and then all the different parts you will have to do start really diving in and researching the project. At this stage sometimes your big idea will fall apart. You will start to really think about all the steps and then figure out that you don’t want to take time or focus away from what you are doing now to implement the new idea. But sometimes you will figure out that your idea is GLORIOUS! 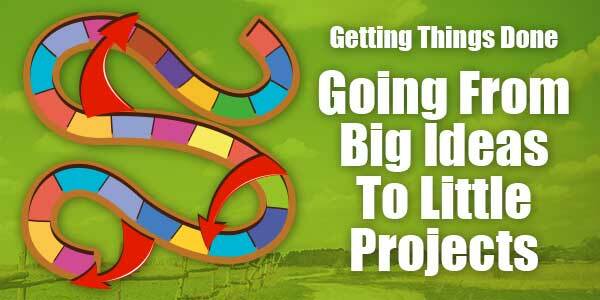 Each thing that you scoped out in the big ideas stage will need to be accomplished to complete your project. And the problem with this is that unless you are sitting around with nothing but time on your hands, you will have to fit your new idea around the things that you HAVE to do in your business now. Rarely will you have the luxury of doing nothing but working on your idea so you will need to have a way of knowing where you are in the process of implementing your idea. That is where the little projects worksheet comes in! You will mark each step of each task either with nothing (not started), a half a mark which means that it is at least started or fully filled out meaning that it is done. This means that next time you have a little space to work on your project, you will know right were to jump in and get a little more done! But There Are So Many Steps! One of the things that I hear often when I talk about my Wicked Good Ideas System is that “there seem like there are just so many steps”. Well, yeah…the fact that you write them all down doesn’t mean that there are any more or less steps, just that you are writing them down and can actually do something about them. If you want to start taking your ideas from just lists and concepts to actionable (and profitable) products and services, check out my Wicked Good Idea System! My ideas about how to actually USE my ideas is loosely based upon the concepts put forth in David Allen’s book, Getting Things Done. My thinking about this started with his “mind purge” concept that you get everything out of your head and onto a piece of paper. This has been life changing for me. No longer do I have to keep all my ideas rolling around in my head, now I have LOTS of ideas that I can actually use and implement instead of forgetting them, having sticky notes all over and random notebooks full of notes. My life is immeasurably better because of Mr. Allen’s ideas and I thank him!